Last night the Fraternity Rectory in Phoenix was broken into. Fr. Eric Flood was contacted at 2 am by the police who informed him that Fr. Kenneth Walker, FSSP had been killed and that Fr. Joseph Terra was in critical condition. Please pray for the repose of the soul of Fr. Walker and for the health of Fr. Terra, as well as for strength for their families in this tragedy. Fr. Kenneth Walker was ordained to the Sacred Priesthood by Bishop Fabian Bruskewitz on Saturday, May 19, 2012. Fr. Joseph Terra served as Pastor of Mater Dei Latin Mass Community from July 2005 until July 2009. The soul of America is gone. When I was a child, Catholics were still being marginalized to the point of being shunned and experiencing verbal abuse. One famous priest involved in Civil Rights told me that many think he became involved because of Martin Luther King. In fact, he told me recently that the reason he became involved in movements for equality was that he was born in Ottumwa, Iowa, a city still known for its Catholicity. When he came up to Davenport to attend seminary, as priests were still trained there then, he quickly noticed the antipathy towards the Catholic Church and individual Catholics. He began to support individuals and worked for equal rights and recognition for Catholic Americans. My dad was literally stoned when walking to school by the Lutherans. And, the above priest told me Catholic youth were being beat up by Protestant gangs in the 1950s. Interesting. But, Catholics had souls, and were willing to be beaten up when they did not deny their Catholic heritage. The Catholic heritage of the immigrants is practically dead, at least in the cities. There are some vestiges of it in the small, very small Midwest towns which were settled by Catholic priests and Catholic immigrants, my ancestors included. However, what is missing is the willingness to identify with being Catholic in America. Too many, in fact, most Catholics I meet identify first with being Americans and second, as being Catholics. This has caused the immigration crisis in some nations, by the way, as Catholics are now being targeted, such as the Kenyan family refused in Chicago for a week visa, to see their son ordained a priest, because of one small mistake on their papers. They were turned away at the airport. The Catholic is part of a international, global, pan-national institution. The Kingdom of God is not bound by borders. Catholics are THE greatest threat to those who want a global government. This is daily more obvious. But, the truth is that most Catholics in America would choose the security of a global government over the security of being in the Catholic Church. The living, baptismal soul of Catholics in many places has been replaced by a dead, consumeristic soul, which chooses daily things over people, events over prayer and comfort over God. The Protestant Work Ethic tied to the idea of predestination as being marked by material success have ruined Catholics. They can and do no longer think like Catholics, and are, in fact, becoming more utilitarian, like their pagan neighbors, no longer seeing the value of suffering or the value of poverty. To “not be poor” is more important than to “be holy” here in the Midwest. What the great saints tell us forms the basis for the Catholic message of perfection through-out the ages; that is, poverty is the way to holiness. To hate poverty, to hate the poor, to want to have a “war on poverty” and eradicate all suffering are ideals of Americans which run contrary to the Gospel message. Christ told us that the poor would always be with us. Why? Because both the poor and the rich benefit from receiving and giving things, money, attention, which would not happen if everyone were comfortable…. Being comfortable is no the goal of life, despite the American dream. Becoming a saint is the goal of life. Angela, the saint for the week on this blog, could not be clearer about Christ choosing poverty on purpose. Why the soul of American has disappeared has to do directly with the choosing of comfort over generosity, of judgment over love, of habit over being open to accepting others into one’s world. There are a few Americans, mostly young ones, who have resisted the siren call of consumerism. Sadly, those who are older and either still trying to have status or resting in a status they have chosen for comfort, have held the spiritual knife which has killed not only their own souls, but the soul of the Church in many areas. Consumerism is not the same as materialism, as I have written on this blog long ago, but the two may be connected. Consumerism is the incessant buying of the best, the latest, the biggest, for one reason-pride. Materialism, which is more common in Europe, is the belief that only the material world exists, and that there is no spiritual world. Marxism and socialism are materialistic ideologies. Americanism and even to a large extent, Catholic Americanism, has become consumerist in ideology. The soul of the Ameican Catholic dies and then stays dead by the daily choosing of things, events, self, the stuff of this world over the glory of the next. Two coffee shops and a mall wifi center in two days....excuse mistakes. The mystic saint I have been following notes that Christ did penance for us His entire life. He also took on the contempt of the world. Perhaps, the most difficult things about poverty and suffering is the resulting contempt brought upon one from others who stand back and judge. Some people are afraid they will slip into poverty themselves, especially in this day of financial insecurity. To be afraid of falling off the edge is an understandable fear. But, as God is in charge of all happenings in our lives, either through His Perfect Will or through His Permissive Will, poverty is willed by God. He may not will suffering which is caused by the greed and selfishness of others, but He allows some to experience this purgation of poverty for the cause of perfection. St. Angela writes of three levels of poverty in Christ's life, freely chosen, freely willed by Him. The first level is that of complete material poverty. As the saint notes, Christ did not own a vineyard, land, silver, gold or other things. He allowed Himself to feel thirst and hunger. He did not eat delicate or gourmet food. His clothes were the rough clothes of a working man, a carpenter. When Christ went into His public vocation, He left His house and all His furniture, His few belongings, and became peripatetic. Matthew 8:20, "And Jesus saith to him: The foxes have holes and the birds of the air nests: but the son of man hath no where to lay his head." This is not a romantic way to live, but one of fatigue and stress. The second level of poverty, according to St. Angela, was that Christ deprived Himself of excellent company. He did not engage in stimulating conversations over wine and cheese with close friends, with idea men or with the powerful. Although The King, He did not converse with kings. His chosen apostles, as we see clearly, were not the creme de la creme of society. Some seem downright stupid, or at least, dense. This second type of poverty may be one of the worst for some to endue. He did not even allow Himself, as the mystic points out, the comfort of His Foster Father, who died before Christ's public life. There was no one to discuss His apostolate with among His companions. Christ was not understood or accepted by His relations, as we see in the Scriptures. Only His Mother was close to Him in thought and word, and for three years, Christ denied Himself her wonderful, holy, blessed company. I shall write about the third level of poverty later. This information should be meditated upon and contemplated. 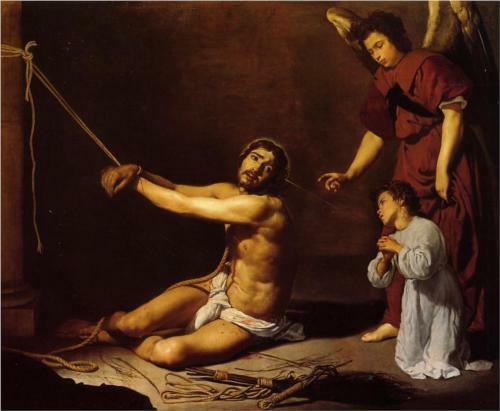 St. Angela writes that Christ's entire life was one of penance. This seems obvious after one points this out. God on earth must have suffered constantly. of the devils, seeing these creatures, being tempted by them, being taunted by them. I was in a situation surrounded by some evil and I could not get away. I just prayed to Abbot Anthony and Abba Poeman and Abba Ischaryus over and over. Something insteresting happened. The evil did not go away, but I was protected, as it was blunted. Christ did not allow himself to have evil "blunted" against Him. He was constantly aware of the sins of men. He was constantly aware of those who turned against Him daily. He was aware of the denial of the Incarnation, Himself, daily. Christ suffered more in the Garden, seeing all the sins of all the humans who ever existed. 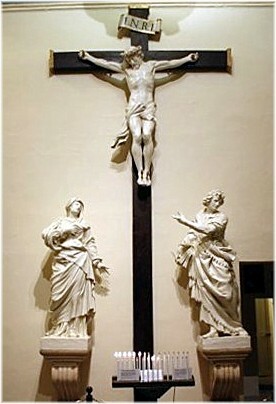 He suffered more on the Cross, taking all that punishment due to sin on Himself. Stop complaining. Look towards the One Who suffered without a break. Well, some of you know this truism. The more one chooses sin, the more one loses one's God-given rational abilities. The more one turns away from grace, the more dense one becomes, losing intuitions, senses of the spiritual life which is all around us, and discernment. It is not that God takes these gifts, but that one begins to build walls which keep one in the material world. This is why psychologists become more and more unintelligent the more they steer away from a belief in God and the soul. How can one get better psychologically by going to a therapist or counselor who never addresses the existence or importance of the soul? I have no idea how many psychologists are actually atheists or agnostics, but judging from the advice some give, I would guess a large majority. 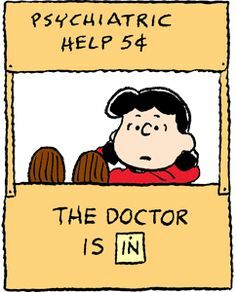 Going to a counselor who ignores the spiritual life for healing and growth is like going to a mechanic for a sick pet. Too many people, including children, daily are taken to counselors, psychologists and psychiatrists who do not believe in an immortal soul. Think about this. How can someone whose soul is the form of the body become a whole and healed human being if their doctor does not believe in a soul?